Here is a touching story I just stumbled upon, about one of the many, more or less, “insignificant” people who quietly and with a passion for human rights, risked their life for human rights. This story is about a German woman, Resi Huber, during her secret aid work as she worked in a labor camp during World War II. Now in October 2012, a square with an Obelisk has been named after her in Munich. Image: Resi Huber (1920-2000) a resistance fighter for human rights. 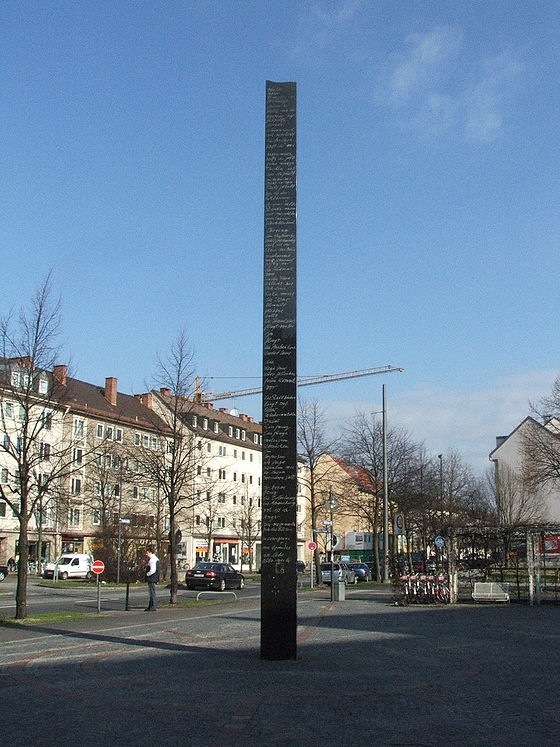 The obelisk at the subway station Brudermühlstraße on Thalkircher Strasse. Resi Huber never wanted to be known as a resistance fighter. As a 22-year-old she helped the Dachau concentration camp deportees, and among others, she smuggled letters and food for the prisoners into the camp. Although she risked her life, she pointed out later, what sacrifices the “real resistance fighters” have fought. – But objectively speaking, Resi Huber was at that time active in anti-fascist resistance, Ernst Antoni said when Resi Huber in March 2000 was carried to the resting place to the cemetery. – Resistance against a criminal regime in its immediate form: as a practice of solidarity with the most vulnerable, the victims of this regime. Resi Huber was born on December 13, 1920 in Dachau under simple circumstances. After her brother died during the war in 1941 and her father died a short time later, she gets a job in the accounting department of the “Plantation,” an SS operational economy, a work among the prisoners of the concentration camp. – It was clear to Resi that you have to do that, because you don’t look away, says Helene Sinzinger, a friend of Resi Huber for many years until her death in 2000. – But she was aware of the dangers. It was not done from naivety. Resi Huber joined the Communist Party of Germany, KPD, (Kommunistische Partei Deutschlands,) after the war, and later she joined The German Communist Party, DKP (Die Deutsche Kommunistische Partei) founded in 1968, and became involved in trade unions. Above all, she wanted to preserve the memories of the past experiences and advocate for peace. For example, she therefore worked in the Society of People Persecuted by the Nazi Regime – Federation of Anti-Fascists (Vereinigung der Verfolgten des Naziregimes – Bund der Antifaschistinnen und Antifaschisten, VVN-BdA) and sought a dialogue with young people, their experiences are described in Sendlinger Kulturschmiede (a think tank at the Cultural Department of Munich) and passed it on to the Otto-Huber-Hütte at the Ammersee, where they founded an anti-fascist and educational center for international meetings. Note: The Otto-Huber-Hütte was built in 1946-1947 by resistance fighters against fascism and Victims of Nazi Persecution. The square on the east bank of the Ammersee was before 1933 a meeting point for youth workers from sports clubs, trade unions, socialist- or communist youth organizations. – She said she wanted to carry on and pass the legacy on to the younger generation. In the 1990’s “recoveries list,” Huber published the names of 60 KDP members, who were murdered by the Nazis in Munich, trying to preserve their history and memory. But still there are names on the list of people about which one knows almost nothing. 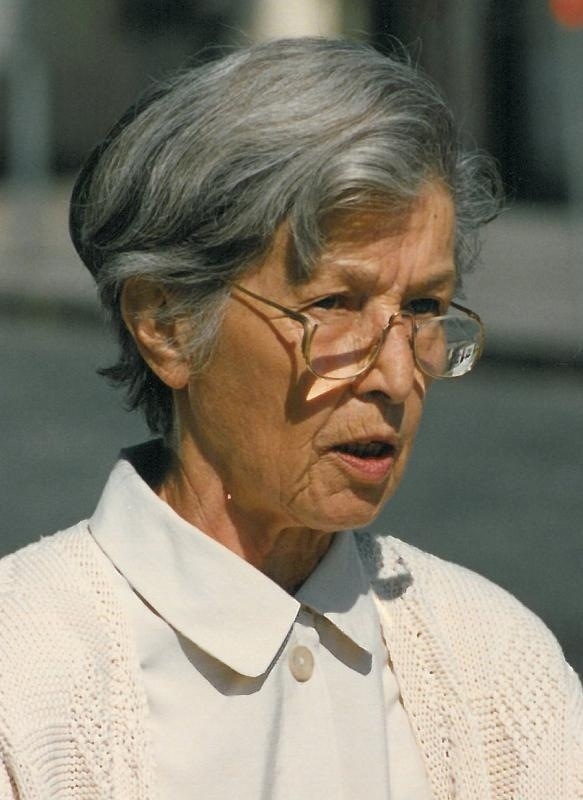 In March 2000, Resi Huber died in Sendling. The city council (Municipal Committee) decided last thursday to name the previously unnamed place at the obelisk above the underground station Brudermühlstraße after her, the District committee in Sendlinger requested a year ago. For Helene Sinzinger, the naming of the place is a signal against forgetting and how important it is in a time when right-wing, facist ideas increase again. My comment after reading this gripping life story. It is usually the people who are not noticed as much, the invisible, often working in silence, who perform real great work. They make no great fuss of their human rights work, but their work is important. And it has now been recognized when Resi Huber now gets a square named after her. • Wochenanzeiger München October 22, 2012. This entry was posted in activity, discrimination, rights. Bookmark the permalink.